A bubble-making machine connected to the Internet. I've had a fascination with bubbles for quite some time now. Especially the large bigger-than-a-person sized ones. I purchased a cheap bubble machine on Amazon.com to bring my shopping cart total to $35 for free shipping. After receiving (and playing with) the bubble machine, I wanted to make it "smart"-er. Thus began the onslaught of ideas from making it WiFi-connected to be controlled with a mobile phone, to 3D printing custom bubble-wands, to increasing the rate of bubble output, to mounting the connected machine on an autonomous quad-copter. For prototyping, I began with an MSP430-WiFi solution and some spare hobby motors. I also found some 25mm 5DC fans used in a past project. A friend of mine recently bought his own 3D printer, so I went to designing custom wands of different shapes and sizes. The Funrise Gazillion Bubble Machine can be purchased from Amazon for $14.99 with free shipping. I tested the MSP430 software offering of Energia and CodeComposer Studio using the motor control and WiFi libraries. 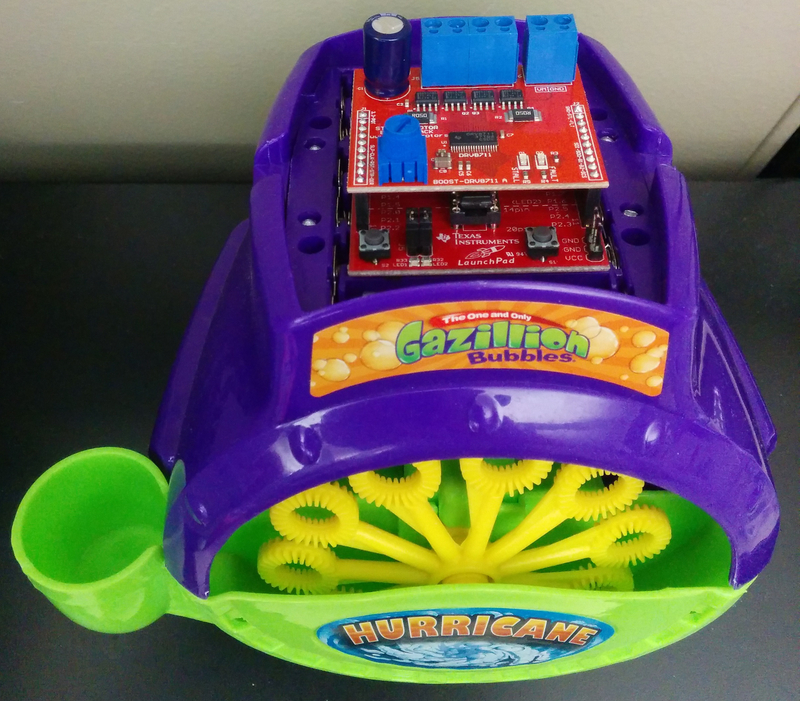 The Gazillion bubble machine has the capability to output 500 bubbles per minute (bbpm). I didn't count each individual bubble, but the bubbly-cloud seems to have an output of ___ bbpm.